When the Pacific and Australian tectonic plates smashed together, New Zealand and its surreal landscape were born. Deep underground the plates flirted and danced, forcing ground level New Zealand to brim with volcanoes, bubbling mud baths, flowering geysers, crystalline glaciers and smoky lakes. 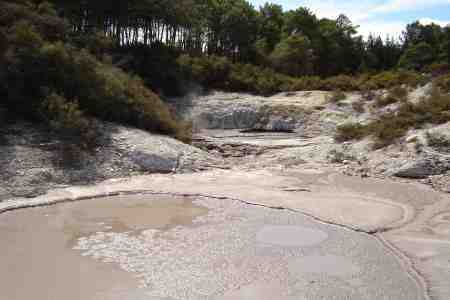 Rotorua, right in the centre of the North Island, seethes with so much geothermal activity (applied by cold rainwater plunging through rock cracks towards heat sources before exploding in geysers and hot springs) that when I first arrive I am immediately jolted by the rotten egg sulphuric smell that regularly accompanies rising pockets of steam. 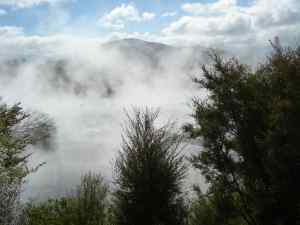 Kuirau Park, just on the edge of the town centre, is perhaps Rotorua’s premier geothermal site hazed in a permanently sulphuric smoky cloud. Gingerly entering the mysterious mist I am confronted with a fizzing lake. Crossing the bridges I am hit by waves of the natural smoke. Later that evening some Anglo visitors and I make a midnight trip to the park. We burst into Smoke on the Water in collective unison and break into air guitar as we breathe in the sulphur fumes. The Maori, Rotorua’s first inhabitants, also saw the theatrics in Kuirau. According to ancient Maori legend, the lake owes its unusual name to a beautiful woman called Kuriau. Interrupting Kuriau’s bathing routine one day was a fearful, legendary monster called the taniwha who seized her for his evil lair below the lake. 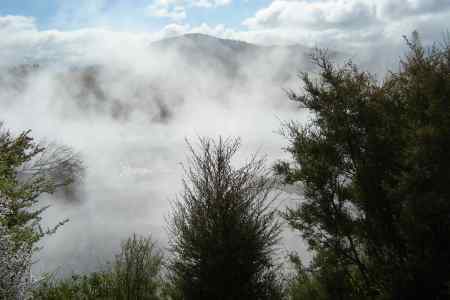 Fuming Maori gods caused the lake to boil so the evil taniwha would be destroyed. Nowadays the bubbling magnetism that seeps beneath Rotorua’s earth is being channeled into New Zealand’s renewable energy projects. Thanks to New Zealand’s subterranean activity this relatively small country nearer to the Antarctic than Europe is engaged in some of the most innovative natural energy schemes in the world. Direct use of the geothermal energy (without the need of a pump or power plant) warms up industrial powerhouses, residential buildings, greenhouses and public pools. Electricity is teased out from the potent earth. The vast majority of the country’s transport relies on fossil fuels. And in Rotorua, the dingiest hostel to the most glamorous hotel provides an on-site thermal pool as standard. Such is the ubiquitous powers of the waters here that travellers doing the round the world long-haul warn of doing any washing in the town – your underwater will stink for ages they confide. But the benefits clearly outweigh the cons. The locals - including the more mature ones - all seem to be blessed with amazingly clear, plump, well-hydrated skin. 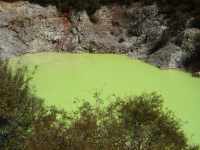 I am keen to experience this beauty side-effect so I take the opportunity to visit one of Rotorua’s natural spas. One of the most famous is The Polynesian Spa which positioned itself comfortably in Condé Nast Travellers’ top ten spas in both 2004 and 2005. I bounce into the simple wooden changing rooms to the sight of a mass of hyperactive Chinese women fiddling with each others’ swimming costumes. They – and I – troop towards the mineral pool: the accepted first stop in the bathing schedule. It is with some amazement that I discover I am as excited as the babbling Chinese women as I bash my elbow on the pool’s stairs in my haste to get in. Instead of wincing at the pain I dip myself into the pool – elbow first – to the immediate panacea of its soothing alkaline content. The Maori were the first to recognise Rotorua’s therapeutic benefits which are said to help with arthritis and rheumatism; the area is often referred to as ‘Cureland’. When the ancient Maori first settled in Rotorua they harnessed its waters for cooking, washing medicines, dyes and ritual bathing. Contemporary Maori still number a large portion of Rotorua’s demographic and see themselves as the natural kaitiaki (guardians) of these precious geothermal treasures today. But for the most part, the Maori and the Pakeha (the Maori term for New Zealand’s white settler inhabitants) work together on these environmentally friendly schemes for the benefit of their country’s clean, green, no-nukes image. After bobbing up and down with the Chinese ladies I progress to the other mineral natural rock pools that increase in heat and intensity. Sweltering in the forty degrees of the Spa’s hottest spot there is little to do but wallow and admire the serene aqua stretch of Lake Rotorua. Chirping on the sidelines of the pool, hemming me in Hitchcockian style, are gangs of native black-billed gulls. All that soaking in Rotorua’s warm, cleansing waters made me feel a little wrinkly, but a 20 minute drive to the Wai-O-Tapu Thermal Wonderland reassured me I had chosen the right waters in which to take my dip. Here lies the visual force of New Zealand’s fault-line in one freaky landscape. Half sci-fi set, half unique eco-system – it is a startling and seductive assault. Vast swathes of bubbling pools in vivid colours, angrily swirling mud pools, cavernous tunnels – this is the environment’s own representation of Hell. Peering into the Devils’ Cauldron, my first thought is a refusal to believe that nature can produce this colour. It looks more as if my five year old nephew has been having fun with Dylon, when in fact, is it one hundred per cent straight-up natural thanks to the mineral content. 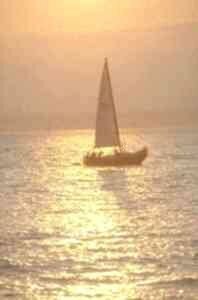 Gazing at the luminescent sunshine tones of the Artist's Palette I am immediately reminded of retro drink Lucozade. It even gases at spots on the surface like the old fizzy favourite but it is a considerable no-brainer to take a drop. Don’t touch signs are planted everywhere in the park and it is even considered risky to walk off the guided paths so fragile and strange is what lies beneath New Zealand’s even stranger earth. One slip and you’re no longing peering at Hell from a safe distance but totally immersed in its 75 degree fury. After my trip around the park I say farewell to Rotorua with one last soak in the far more temperate and relaxing waters in the hotel before hunkering down into a deep sleep matched only in intensity by my now glowingly radiant skin. If you enjoyed reading the above article then you will probably also enjoy the Whitsunday Islands, also in Australasia, and our latest articles covering the Orinoco Delta, La Mata, Marbella and Beijing.